Toys are used in Z’s occupational therapy. In an hour’s time, he gets to use about 3-4 different kinds of toys for different activities. So with that, I have been consciously buying toys similar to what he uses in therapy to ensure continuity in his home activities. Here’s a few of the things that Z uses for his home activities to support his therapy sessions. A lot of these I got from Pinterest (it is such a great resource for these kinds of activities) and also from other blog sites and websites about motor skills development. These wouldn’t really cost so much as either you can buy them cheap or you can DIY them (as I have on some) if you have a few minutes to spare. Trace the circumference of the tissue core on to the thick board paper. What I used was the trimmings of an illustration board that I’ve used for a previous project. You can use an old folder or a cereal box, too. Cut out the circles depending on the number of containers you need. Use the cut out board to cover one end of the tissue core using a glue gun. Using hot glue makes the board stick better to the tissue core compared to regular glue. Make sure that the hot glue is spread evenly and the cut outs cover the exact bottom of the tissue core. 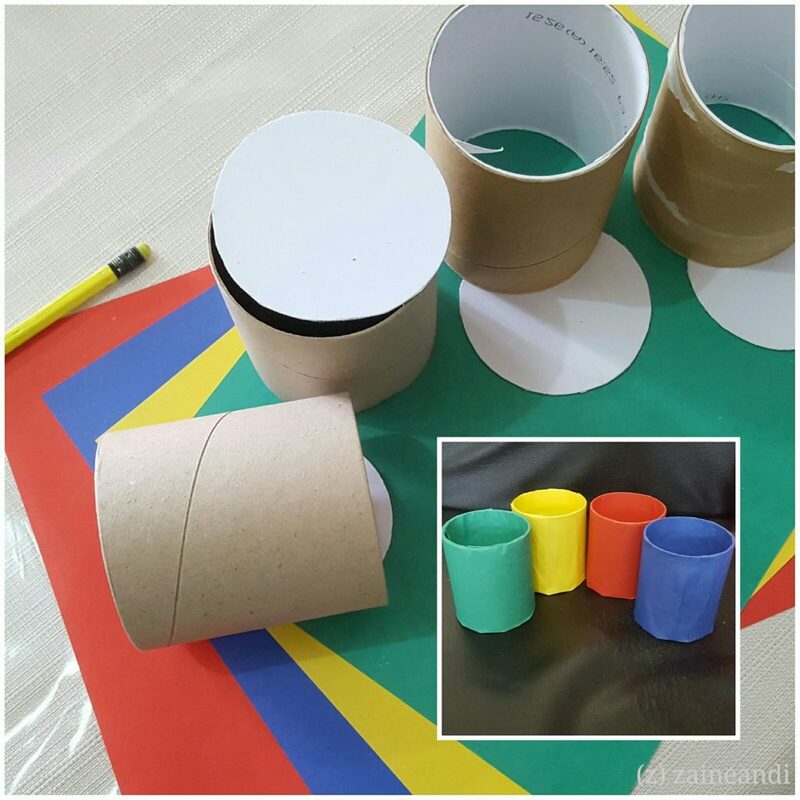 Cut your colored art paper based on the height and wrap it around the core using glue. If you have excess art paper, you can also cover the inside of the makeshift container or you can leave it as it is. If you find that tissue cores are small for the type of container you need, you can use any boxes available – milk box, cereal box, etc. You can just cover those with colored art paper. These makeshift containers have a lot of uses: it can be used for sorting activities, color matching, scooping pebbles from one container to another, etc. 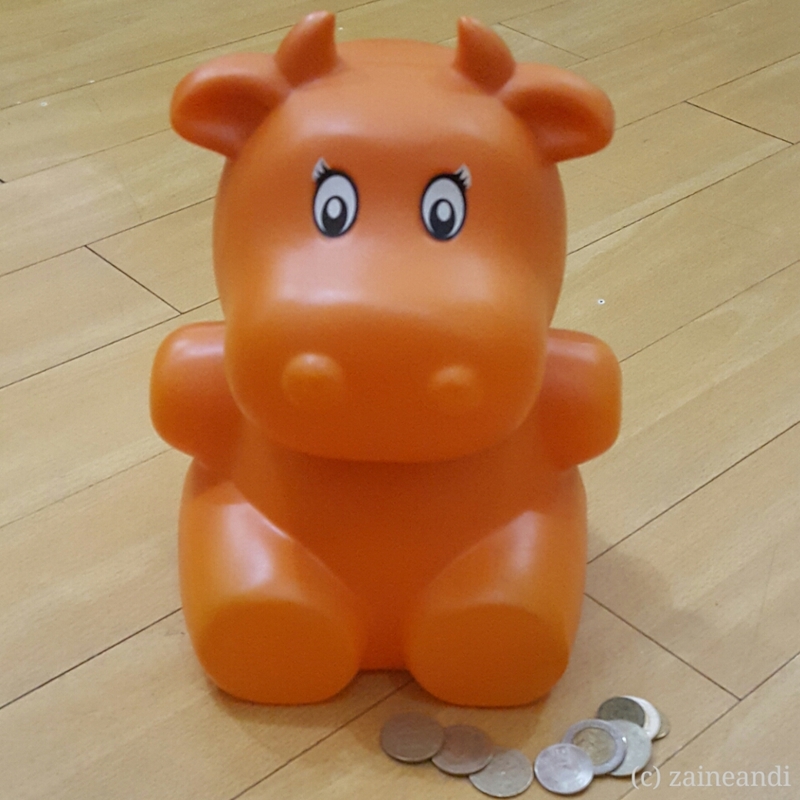 I got this coin bank (I call it “moo bank” since it is a cow LOL) from Toy Kingdom for Php 99.75. If you don’t have any coin banks lying around, you can DIY one using a plastic container (could be an empty cocoa powder container or pet bottle) or even a box. Coin shooting is a good activity to develop the pincer grasp. Z has a similar activity in his therapy sessions using big tokens to shoot. Coins are a lot smaller than those tokens which makes it harder as well for Z to pick up and shoot since the coin bank’s opening is slimmer compared to the toy version. I would recommend starting with the bigger coins – 5-peso and 10-peso coins – as these will be relatively easier to pick up and shoot. Once they got the hang of the bigger coins, then you can incorporate the 1-peso coin until such time that you get to the smallest ones – the 10-centavo and 5-centavo coins. Z is currently doing 1-, 5-, and 10-peso coins. This is also a good activity to start teaching about savings and investments to young kids. Hey, there’s no better time to teach kids to save than now, right? 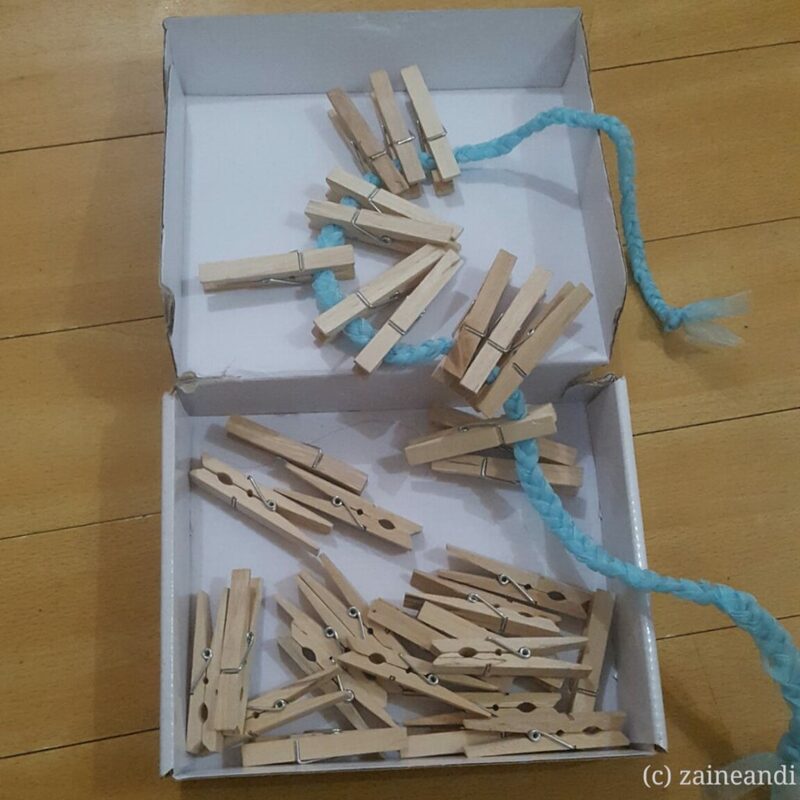 Another activity to help develop the pincer grasp is using clothespins. Playing with clothespins also help with control. I bought these from a Japan store for Php 88.00. The string in the photo is excess ribbon I had from gift wrapping. I just braided it to make it a bit thicker and easier to use. Cut the diaper box into the size of the puzzle board that you need. You will be needing 2 pieces of the same size. The first piece will be your base. Trace the shapes patterns on to the second board. Carefully cut the shapes out of the board using a paper cutter knife. If in case the shape gets destroyed in the process, you can just trace the pattern on to another board and use that cut out instead as the puzzle piece. Cover the board cut outs with different colored art paper. Also cover the base board with art paper based on the color of the cut out shape just like what I did in the photo. Yeah, I had a bit of time. LOL! The whole puzzle board took me a little over two hours to finish. And yes, I know, there are a lot of puzzle boards available in toy stores as well so if you don’t have time to DIY, you can just buy. But with all of the options out there, make sure to find one that will fit your kid’s activity requirements, too. This is actually the reason why I decided to DIY. Majority of the puzzle boards I’ve seen has too many colors and designs going on and what I need is just a basic board with solid colors and simple shapes. 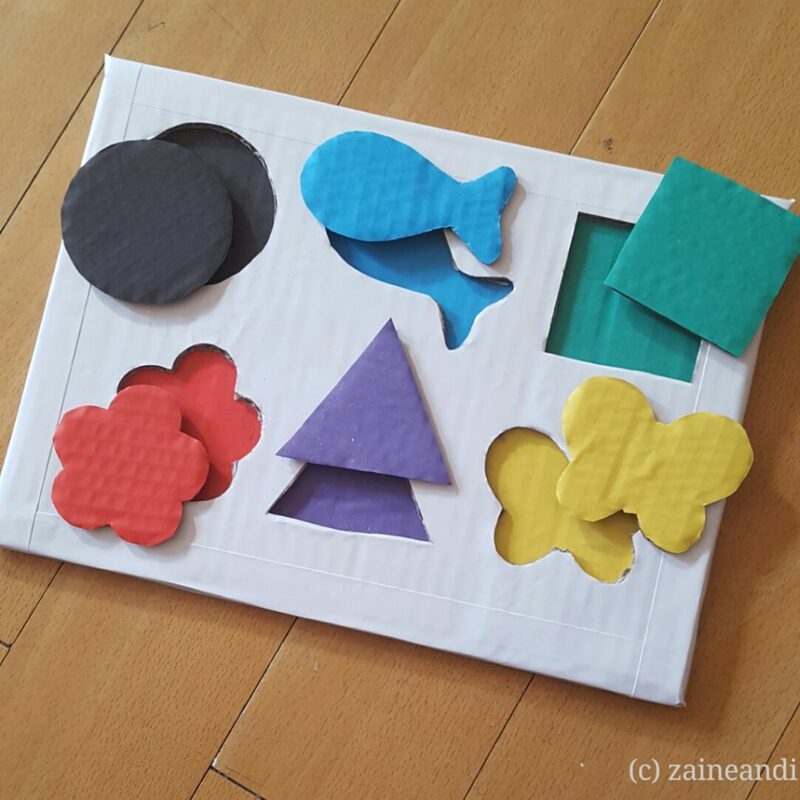 Z is still learning the concept of turning a piece in one direction or the other to fit the puzzle and at the same time, I am trying out different activities that will help him understand the concept of colors and shapes. Hence the board I made consists of 3 basic shapes and 3 different ones. So there. I do hope that these will help somehow give a few ideas on what we can do to support our child’s development. There’s really no need to spend so much on toys. All we need is just a little bit of creativity and patience. Being able to attend Z’s therapy sessions, I not only see him make progress in terms of development. I also get to learn a lot of things that perks up my creativity. It actually feels nice to be able to DIY a few things for the little boy to use. And I know that this is just the beginning. There will be a lot more DIY projects for this momma along the way. And I am excited! Thanks, Michelle! 😊 Don’t worry, you’re not alone in having no time to comb. Lol! Love all the DIY toys you did! I’m also a ‘pinterest mom’ if there’s really such (lol) as I love browsing there and try to do it myself! I’ve done some of it and most of it -not yet. Wow. I will definitely try this with ny little one. Oohh so crafty. Thanks for the ideas. My preschooler still enjoys activities like these. I also did a lot of DIY stuff for my son who attended OT session before too. Our fave is the home made clay to develop his fine motor skills. These are really great recommedations and quite ingenious if I may add. I especially liked the clothes pin and string. Thanks for sharing and inspiring creativity in your readers. I love everything that you did especially the puzzle board! I never thought that we can make the use of coinbank fun. Thanks for sharing, Liz! Those are all very creative ideas. Thank god for Pinterest, huh? I get so many ideas there, too! I truly love your diy ideas. Sometimes we tend to.buy expensive toys for our kids when we can do them ourselves. We just need to be extra creative and yes, Pinterest is a such a helpful venue to look for ideas. These are some great ideas!! My mom worked in the elementary schools and I’m sure that she’d have loved to use some of these ideas! These are such great ideas! My kids would have loved them when they were smaller. Thanks for the tips! I’m going to try making a few of these as I have an almost 3 year old running around, and this looks like it would keep her busy and promote some motor skill building as well! That puzzle board is so cute and so creative! I love that it turned out so well – I hope your son loves it too! Great ideas! I would love to try this with my nieces this Summer. I am sure they’ll enjoy. We use tissue cores at home, too, for my son’s art activities. It’s really a relief to have online resources where we can get ideas for activities that our kids can do at home. This is nice, I’m sure your child will benefit from it. Therapy sessions are expensive, so these DIY activities will be very helpful. This is nice, I’m sure your child will benefit from it. Therapy sessions are expensive, so these DIY activities will be very helpful to other moms. This is amazingly creative. I would have never thought to creating my own puzzle boards but these look amazing. Those are really nice ideas! It’s always great to start them early with the activities. It’s a fun learning experience for them. These will definitely help exercise their motor skills and allow them to learn while playing. Parents can totally benefit from this post! So cool! This is so cute. It’s amazing how parents these days get super creative. I guess you all had a fun time doing this! You got me at control freak.I Understand. What a great post. Thoroughly enjoyed reading it. Thanks for sharing your post with us. This is amazing! I have to go get some supplies this weekend so I can make them for my daughter! What a great idea! I love the puzzle box idea. I think that would be great for preschoolers to learn shapes and colors. These are all great ideas for toddler activity. I love the puzzle and I might do it with my little one. Love the DIY puzzle board! Wow! Great fun ways to bond wit your little one. Among the 4 my favorite is the cardboard puzzle. I love the different colors. Love DIY! Diba you don’t need to shell out a lot of money for the kids to learn! Love this!